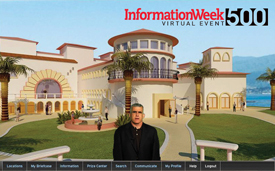 Congratulations for making the 2012 InformationWeek 500! The InformationWeek 500 is the most prestigious list in the business technology industry, recognizing the most innovative users of technology across the United States. Share this wonderful achievement with your employees, your company, and most importantly, your customers. To help you promote your award, we've put together a press release template for you to personalize and distribute. You may also craft your own press release; however we ask that you share it with us if you do. Just remember: you can't jump the gun. You must hold your announcement until Wednesday, September 12, 2012 after 9:00am ET. Get started and log in today...you'll need the user name and password given to you by InformationWeek. If you cannot locate yours, please send an email to [email protected]. Experience highlights from the live conference, as well as exclusive content presented in a unique virtual environment, on Oct. 6. Learn more and register now. Congratulations! You've made the InformationWeek 500! Download a winner's press release template and start tooting your own horn. Download PR template. Contact our partner, Wright's Media, for reprints of InformationWeek 500 content. Mobility is demanding the attention of IT. Whether it's building a scalable wireless infrastructure, or supporting the newest smartphone or tablet, the choices are daunting. Interop's wireless and mobility conference track can help sort out these challenges. Read more. Many business technology organizations still have a long way to go when it comes to project and portfolio management and functioning like a well-oiled machine. Read more. The InformationWeek 500 Conference offers unparalleled content, editorial vision and renowned keynotes from leading organizations across the globe, they convene here to discuss how they're delivering on the most critical business priorities of the day. The conference represents a unique opportunity to meet and interact with the most respected and recognized business technology executives in the world. Be there Sunday, September 11 through Wednesday, September 13, as we gather and celebrate the 500 most innovative users of business technology at the InformationWeek 500 Conference and Gala Awards Dinner.